wooDsom Gentle Dog Brush Set, Bamboo Massage Brush for Medium/Large Dogs with Detangler Travel Brush by wooDsom at Annie's Dog Spa. MPN: unknown. Hurry! Limited time offer. Offer valid only while supplies last. Treat your dog with the love he deserves. After de-shedding and grooming her fur with a pin brush, massage your pet with our premium pooch paddle. Treat your dog with the love he deserves. After de-shedding and grooming her fur with a pin brush, massage your pet with our premium pooch paddle. The minute you start using the bamboo brush, your dog will relax with its gentle massage - completing the groom with a positive experience. 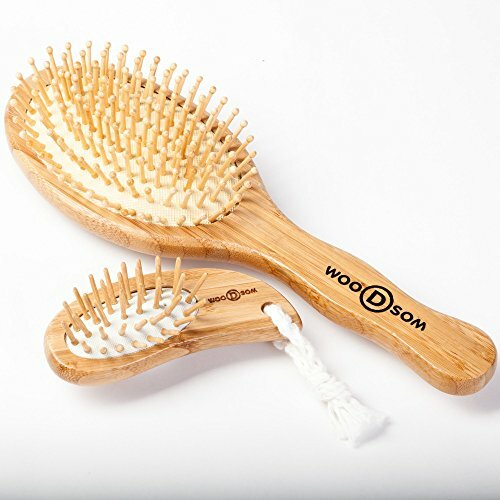 The wooDsom Bamboo Massage Brush Set provides a gentle comb of medium to long fur. The large brush bristles are domed at the tips to gently massage your dog's skin. No sharp scraping or accidental scratching. Sized for medium to large dogs. Small brush is handy for minor detangling of long fur and tail while on the go. Pamper your pooch with a final massage brushing when grooming is complete. Pins made of smooth, rounded bamboo for a gentle, relaxed finishing brush of your dog. Detangler brush has straight pins for light detangling of medium to long coats. Small detangler brush fits in the palm of your hand, travel size, 4" long. Large brush, 9.5" long is ideal for finish-smoothing the coat while massaging the skin.